A very recent trip to New York City had me glancing at the quickened steps of dapper men negotiating the streets with purpose to their stride. I imagine this is how you must walk about your town, hunted as you and your loved ones so often are. Alas, no tales of even the most fleeting glimpses of Liev and Co. to revel those I left behind with upon my return. But the taste of the place you call home will be forever on my tongue. You were in NYC and you didn't tell me?! Damn you, woman! We need to catch up, by the way! I've been checking the forum all day, yesterday, to see if there was a special Happy Birthday thread. It's been way too quiet on the forum. I posted something ages ago to stir things up, but no replies yet. Come on ladies, we need to stay in touch. Discuss what keeps us going. And most importantly, discuss the hotness that is Liev. At this point all I can do is be totally lame and blame it on the ever popular Baby Brain. I am offically no longer in control of my cognitive abilities (what little I had in the first place). I have already, if you can believe it, called a locksmith when I could not get my CAR key to unlock my office door AND reported my car stolen when I forgot that I walked home from the pharmacy because it was so nice out. This combined with the fact that the only press since the Goon release has been of the pap variety, and we know where I stand on that, means there's literally been nothing new to report. 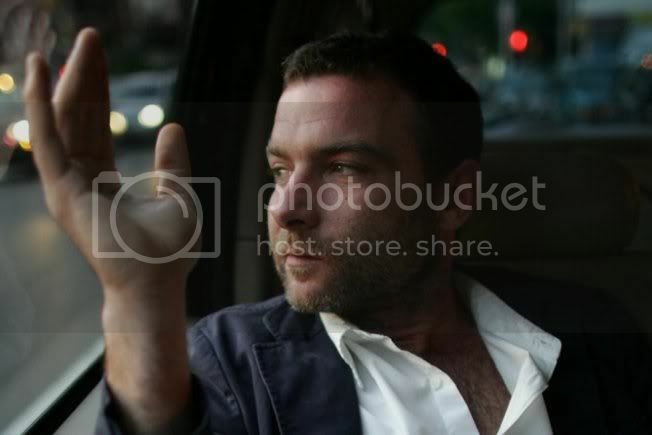 Although I have learned that Liev will be leaving shortly for Atlanta to shoot with Kate Hudson - more details to follow. @ Sofia I'M SO SORRY - it was a last minute deal we got for 5 days and no weekend time so I didn't want to tell you because I know it's far for you to come in and I'm guessing you're working during the week? I didn't contact Seph either and I know she was going to be there some time in Sept, right? Did you guys get together? I feel bad but it was SO SHORT considering 2 of the days were solid travel. Not a lot of time, just a chance to use up some airmiles and get away before I become happily housebound. I must say I can see why you're so passionate about The City. This trip really tantalized us into wanting to come back for more. No worries! I am working full time during the week, but I figure I could've made a pilgrimage on a Friday or something. And yes, me and Seph did meet up when she came down! Most of our plans got screwed, but we did have loads of fun trotting around Manhattan. Got a few stories to tell yah, haha! I'm so happy for you! Baby Brain sounds like all the crap I gotta put up with from sales people I work with lol Do you guys have baby names picked out?? Sales people = 1 track minds? No, they are the equivalent of silly gerbils with one track minds. Haha.